Along the Raritan River: South Amboy to New Brunswick ~ The History Girl! In 1650, Cornelius van Tienhoven, a Hollander traveling through the American colonies, described the region inhabited by the Raritong Indians as “the pleasantest and handsomest country that man can behold… furnishing the Indians with an abundance of maize, beans, pumpkins, and other fruits.” Trade flourished here as well, as “through the valley pass large numbers of all sorts of tribes, on the way north or east.” Worn over the centuries, the “Old Indian Path” crossed the Raritan at its furthest point of sloop navigation and grew into one of the nation’s busiest arteries, connecting New York City and Philadelphia via New Brunswick, which grew around this vital river crossing. A ferry was first established here in 1681 by an Englishman named John Inian, where the Raritan’s freshwater turned tidal. Bridges followed, firmly establishing the route of the New Jersey Turnpike, Route 1, the Lincoln Highway, and Amtrak’s Northeast Corridor. George Washington crossed the Raritan River here with his army many times during the American Revolution, both in victory and defeat. At the other end of the Lower Raritan, a place the Lenape called Ompoye, colonial Scottish investors envisioned a second London, a fortified deep-water port city that would outshine New York City. They called it the City of Perth. 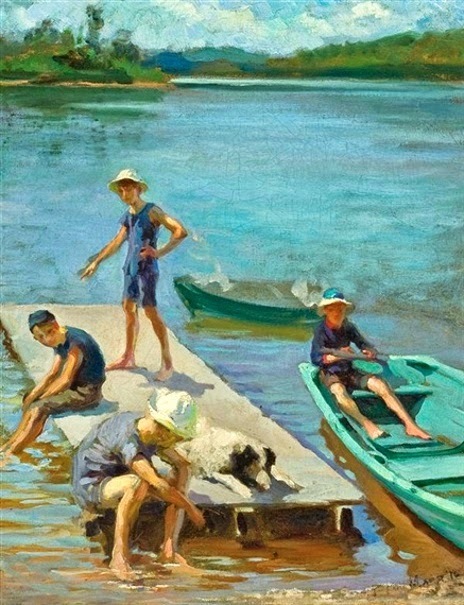 Painting: On The Raritan, Perth Amboy, New Jersey - Francis Luis Mora (1874 – 1940, Uruguayan-born American) - Since the Lenni Lenape first inhabited this region, the Raritan had been a treasured source of recreation and relief during the warm summer months. During the Revolution, the river provided Washington’s troops fresh drinking water in New Brunswick. Sailing ships were known to stop here to fill up their water casks before long trips out to sea, believing the water of the Raritan to be superior to water that might be procured anywhere else in the region. Recreation flourished on the river alongside industry, but theirs was a precarious relationship. Cutlassfish, locally known as frostfish, were peculiar to the Raritan, and well known to the locals of all ages who fished its waters. American shad had once run thick in the Raritan, and residents, many of them children, caught shad in great numbers to be hawked in the streets of New Brunswick. Most often salted or pickled, for generations shad was a common local delicacy. But by 1920 pollutants had caused a catastrophic decline in fish and shellfish populations, effectively putting an end to fishing in the Raritan. In 1684, Andrew Radford began operating a ferry to Perth from the “Outer Plantations” on the south bank of the Raritan, establishing the first link between the Amboys. It took a railroad bridge, two hundred years later, to finally end ferry service. Then in the twentieth century, the Edison Bridge, followed by its sister-bridge, the Driscoll, rose over 250 feet above the river, expanding together over time to become the world’s widest bridge, and one of its busiest. By the dawn of the Industrial Revolution, New Brunswick and the Amboys were the economic, commercial, and cultural hubs of the Lower Raritan River, and their early history was marked by continual competition. As is the case today, anyone traveling between New York and Philadelphia had to cross the Raritan River, and both cities were eager to gain control of that route. The Industrial Revolution brought steamboats to the Raritan. While before, South Amboy and New Brunswick competed to attract travelers to their ferries from the dirt roads that led to river, the steam age gave both ports a direct link to New York City, but not without the help of the Supreme Court. Fighting to overturn a steamboat monopoly on New York’s waters, the legendary tycoon Cornelius Vanderbilt flew flags from his steamers in the Raritan that read “New Jersey Must Be Free!” until the landmark Supreme Court ruling in Gibbons v. Ogden opened New York’s waters to interstate commerce. Vanderbilt then settled in New Brunswick with his wife, where she ran a popular hotel while he captained steamers up and down the Raritan, promoting that city as the transfer point between steamboats to New York and stage coaches to Philadelphia. 1850 Map of the Raritan River - In 1850, the Lower Raritan River was the center of activity in Middlesex County. From colonial times, villages, towns, and cities flourished on its banks. Farmers, merchants, artisans, industrialists, and laborers alike all benefited from and relied upon the Raritan; It was the economic lifeblood of the entire region. It was also the center of culture, from which news spread and information was given and received. Of Middlesex County’s 28,000 residents, half of them lived in either the Amboys or New Brunswick, the county’s largest city by far with over 10,000 residents alone. Outside of these cities, the landscape was still rural, covered mostly by forests with extensive salt marshes along the banks of river. The river made this a desirable place to live, and thanks to the prosperity it brought the region, Middlesex County is today home to over 820,000 people. Then in 1833, the first train whistle blew in South Amboy, and the once quiet hamlet on the Raritan would never be the same. New Jersey’s first railroad, the Camden & Amboy, transformed the small ferry port town into a boisterous freight and shipping center. More railroads would follow, and by the close of the nineteenth century, South Amboy’s waterfront was filled with coal cars from the anthracite fields of Pennsylvania, Maryland, and West Virginia, ready to be loaded into barges waiting in the Raritan. In the middle of the 19th century, massive clay deposits along the river between that city and New Brunswick drew thousands of immigrant workers into the brickyards of South River and Sayreville, where the Sayre & Fisher Brick Company steadily grew into the largest brick manufacturer in the world, owing its success to the transportation the river offered, and the seemingly limitless natural resource found in its banks: clay. Industries of nearly every kind flourished along the Raritan because of its easy access to an abundant water supply, and the blessings of geography bolstered by a competitive transportation network, which put the Raritan River in close contact with many of the nations largest markets. The economic prosperity that the Raritan brought to the region was, however, threatened by the very industries that the river brought to life. For over a century, the river was used as, in the words of the Raritan Riverkeeper, an “industrial garbage can.” The uncontrolled and accelerated disposal of industrial toxic waste in the river, coupled with an unregulated flow of sewage from a continually growing population turned the “Queen of Rivers” into an acute threat to public health and safety. By the 1920s the once alluring and majestic river was all but destroyed, its waters dimmed by waste, and its banks poisoned by trash and vile odors. Once home to a robust fishing industry, fish and shellfish populations were decimated, and what remained was no longer safe for human consumption. In 1997, the Raritan was ranked the 14th most polluted river in the United States with over 200 contaminated sites in its watershed, 24 of them federally designated superfund sites. JCP&L’s E. H. Werner Power Station at South Amboy, 1960s - A chemical and biological survey conducted by the Department of Water Supplies and Sewage Disposal of Rutgers University concluded in 1928 that, because of sewage, surface runoff, and industrial waste, it was “too dangerous to swim in the Raritan River from the town of Raritan to Perth Amboy.” Then in a 1930 report of the Port Raritan District Commission, it was stated that the Raritan River was essential to both life and industry, and that its economic value was threatened with destruction at the hands of pollution from millions of gallons of raw sewage and industrial wastes. The report noted large deposits of filth, odors, and discolored and poisonous water, making the river a menace to public health and an active source of danger to the communities along its banks. 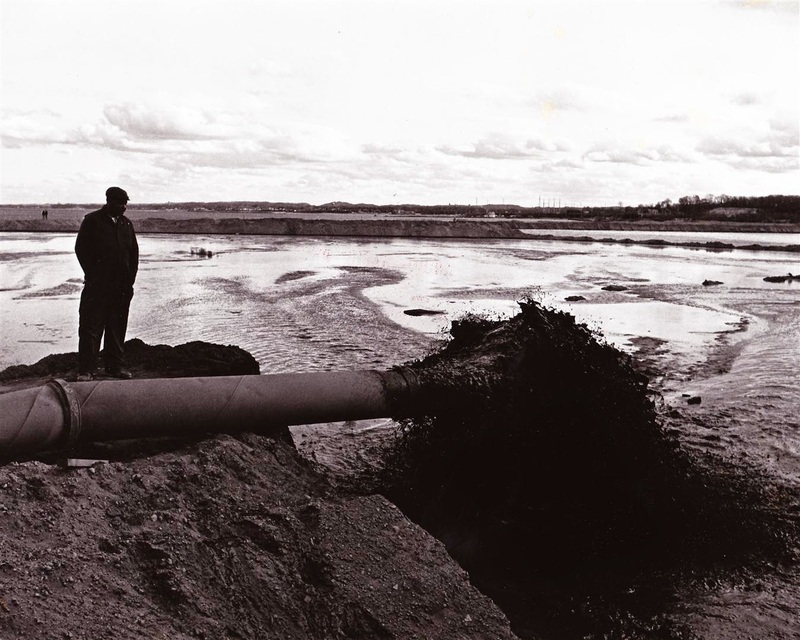 In that year about 36 million gallons of sewage was being discharged into the Raritan each day! Industries flourished along the Lower Raritan because of the convenient access to an abundant water supply and transportation that it provided, in addition to its geographic location. But from the beginning, industries disposed of waste products by freely discharging them directly into the Raritan. In just one example, the coal loaded into JCP&L’s E. H. Werner Power Station at South Amboy was pulverized into a powder and fed into burners that heated the plant’s boilers, the steam from which turned two 25,000 kilowatt turbo generators. The ashes left behind were suctioned out the slag heated into a liquid that was piped directly into the Raritan. I have lived near the Raritan and South Rivers all my life. And while the circumstances of time have forbid me from from swimming in the Raritan like so many before me, I have fished, crabbed, kayaked, and sailed these waters, and in doing so, encountered riverscapes both breathtaking and heartbreaking. I have witnessed firsthand what we have done to the Raritan, and I have also seen what it has done to us, when it has suddenly flooded its banks and forced its way into our streets and our homes. I wrote this book firstly to explore how the Raritan has shaped our local history and what it has meant to all those who have lived beside its tidal waters, but I also wrote it to offer questions about our relationship with the river - what it was, and what it could be. Whether knowingly or not, the Raritan River has shaped the lives of countless millions of people. It has been both conquered and cherished, exploited and admired, ignored and fought for, and whether we acknowledge it or not, we are all stewards of the Raritan. Thy bitter journey to the Seas. Jason J. Slesinski is a native of Sayreville, and the 6th generation of his family to have lived there. This connection to local history led him to involvement with the Sayreville Historical Society where he currently serves as vice-president. In 2013, he was appointed by the mayor and council to the position of borough historian. In 2006 Slesinski graduated from Montclair State University in where he studied History and Latin before completing a master’s degree in American Studies at Rutgers University. His graduate studies focused on urban environmental history, land-use, oral history, and American cultural and artistic production. An active member of the Sayreville Historical Society, Slesinski has conducted oral histories with local residents over the past four years, which he has made available on YouTube. His first book, A Cultural History of Sayreville, was published in 2012. Funded by a grant from the Middlesex County Cultural and Heritage Commission, all proceeds from the book help support the Sayreville Historical Society Museum. Slesinski works at an advertising agency in Manhattan. Aside from researching local history, his spare time is occupied by cycling, kayaking, and above all, gardening. 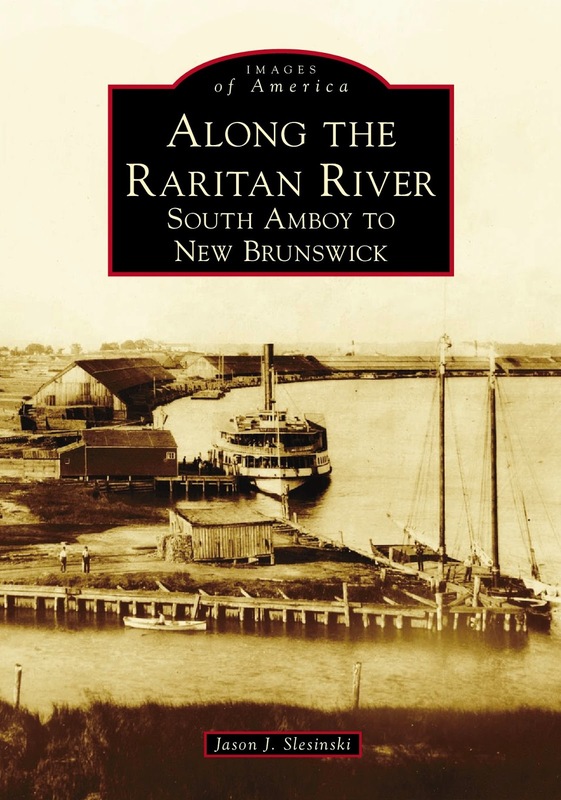 Purchase a copy of Along the Raritan River: South Amboy to New Brunswick here.